Good news for the candidates who are looking for the NALCO Recruitment 2018. National Aluminium Company Limited is a Navaratna CPSE under the Ministry of Mines. The candidates who want to settle down in the Government Jobs can check the National Aluminium Company Limited Jobs Notification. Candidates who are curiously waiting to make their career in the Navaratna Company Jobs they can check this article to get the latest information about the NALCO Job Openings 2018. Without wasting the time the aspirants can refer the entire details regarding the NALCO Recruitment 2018. The contenders who have interested to work with National Aluminium Company Limited in India go through the eligibility details like educational qualification, age limit, NALCO Selection Process, pay scale details etc from the below of this page. Here on this page, the candidates find the NALCO Jobs 2018 for freshers as well as experienced jobs. This is the good chance of the aspirants to get the job in the Central Government Sector. As there is high competition for the government jobs in these days. So the candidates who are willing can fulfill their dream of securing the job in NALCO. Every year the NALCO will release the NALCO Recruitment 2018 for various vacancies. In the same way this year it released the National Aluminium Company Limited Jobs 2018 Notification. For this recruitment, the authorities are inviting the applications. The candidates who had possessed BE, B.Tech, CA, Diploma, B.Com, B.Sc, ME, M.Tech, M.Sc, B.Fsc, M.Phil, Ph.D., BCA, B.B.A, CA, MBA/ PGDM, Full-Time Bachelor’s Degree in Engineering /Technology from a recognized University or Institute can apply. Most of the candidates who are applying for the NALCO Recruitment 2018 are in confusion about the age criteria. The Minimum age limit of the aspirant should be 21 years and the maximum age is different for any position. Contenders should also about the age relaxation before applying. For that details, the applicants go through the official notification. Every applicant has to meet the eligibility criteria announced by the National Aluminium Company Limited. If any of the candidates applied without meeting the criteria their applications will be rejected simply by the authorities. Aspirants who are worrying about the NALCO Selection Process. Now they no need to worry we are providing the complete details about the selection rounds in the later section of this page. Written Test and the Personal Interview are the rounds of the selection process. Apart from this, the candidates will be recruited through the GATE Score. NALCO was established on 7th January 1981 which is having the registered office at the Bhubaneswar. National Aluminium Company Limited is a Navratna CPSE under Ministry of Mines. The company is one of the largest integrated Bauxite-Alumina-Aluminium- Power Complex in the Country. NALCO has units in Odisha at the place of Angul and Damanjodi. the NALCO produced various products such as Aluminium Metal and Aluminium rolled products. So the candidates who are willing to apply for the recent NALCO Recruitment 2018 Notification can apply for the vacancies before the last date. For more details visit the official website of NALCO www.nalcoindia.com. To get the job in the Navaratna Company such as NALCO the candidates have to do hard work. For the selection of the aspirants the written test is the main step. To perform well in the written test the applicants have to prepare by using the NALCO Syllabus 2018 and Previous Year Question Papers. This kind preparation will definitely help the aspirants to get a place in the National Aluminium Company Limited. There is high competition for the government jobs in these days so the applicants have to put their maximum efforts to prepare for the exam. Candidates who possessed BE, B.Tech, CA, Diploma, B.Com, B.Sc, ME, M.Tech, M.Sc, B.Fsc, M.Phil, Ph.D., BCA, B.B.A, CA, MBA/ PGDM, Full-Time Bachelor’s Degree in Engineering /Technology from a recognized University or Institute can apply. Other than these qualifications they do not apply for the NALCO Recruitment 2018. The age limit is very important while applying for the NALCO Jobs. The Lower age limit is 18 years and the upper age limit may be varied from one post to another. Basically, the officials conduct the Written Test and the personal Interview to recruit the candidates for various positions. First, the candidates have to give the Written Test and the aspirants who qualify in the test with the good score they allow for the next rounds. The Personal Interview will take place on the company premises. Candidates need not worry about the salary. The NALCO offer attractive pay scale for the selected candidates as per the rules of the company. Apart from this, the company offers the extra benefits for the employees. For every post the application fee is different. For each category, the application fee decide by the officials of the company. The candidates have to pay the fee it in the online mode. Move to the official website of National Aluminium Company Limited i.e; www.nalcoindia.com. Find out the “NALCO Recruitment 2018” and refer the complete details. Select the most suitable for your eligibility and apply for it. Click on the on the apply option. A screen appears with the empty fields. Now enter all the required details correctly. 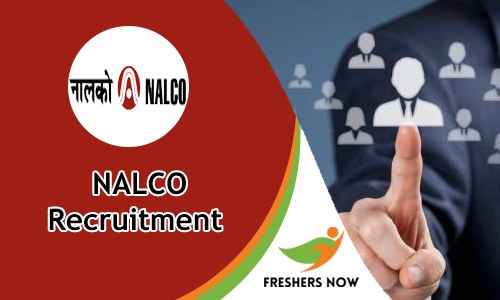 For More latest updates about the NALCO Recruitment 2018 aspirants can visit our website, Freshers Now.